The commissioners also granted two alcohol licenses. In both cases, Commissioner Chair John Daniell warned the recipients that the county is serious about enforcement of its ordinance governing alcohol sales. Daniell specifically warned the recipient of a license for a convenience store opposite the student housing complex Athens Ridge about underage sales. The rezone of the acreage on which the fire station is located from Office-Institutional-Professional to Business was unusual in that the applicant, the county itself, did not provide any plans for use of the property. Normally the party seeking the rezone submits concept plans indicating what will be built on the property, and the rezone ordinance incorporates those plans. At the request of the planning staff, the Board of Commissioners did approve three conditions with the rezone. The first specified that the Board of Commissioners must approve concept plans in the future prior to approval of the preliminary site plan and the site development plans. The second specified that a hotel of 55 feet and less in height can be approved by the staff, but any taller hotel must be approved by the Board of Commissioners. The final condition listed 59 uses that are prohibited, including tatoo parlors, pet boarding kennels, adult entertainment, and billiard and pool halls. No one registered to speak either for or against the rezone request, but Commission Chair John Daniell said he would allow comments from the audience. I asked if he could provide any information for the public about the plans for the fire station. He said he hoped it would not be long before a site could be identified and the station, officially Fire Station #8, is moved. The Board approved the rezone unanimously. County Attorney Daniel Haygood told me after the meeting that the land on which the existing fire station sits was donated to the county. That fire station, called at the time the Mars Hill Road Fire Station, was built in 1997, according to county tax records. At that time, the existing Oconee Connector did not exist, and Daniells Bridge Road crossed SR 316 and intersected with Jennings Mill Road, rather than intersect with Mars Hill Road. On July 29, 1997, the county entered into a complicated agreement with A. Paul Keller Jr., James J. McDonald Jr., and Mary Beth McDonald, who owned land affected by the construction of the Oconee Connector and the extension of Daniells Bridge Road. That agreement allowed for the extension of Daniells Bridge Road to its current terminus with the Oconee Connector and Mars Hill Road. As a result of that agreement, the county swapped out some right of way and agreed to grant curb cuts. As part of that agreement, Keller, McDonald and McDonald could buy another property for the fire station, build another fire station, and then obtain the land on which the current fire station is built. The county had to agree to the location and approve the replacement station. The terms of that swap expired in 1982, according to the agreement, which Haygood provided to me today. The 4.5-acre tract to the north of the fire station, at the southeastern corner of the Oconee Connector and SR 316, is owned by 316 Holding Group, in care of James J. McDonald Jr., of Athens. The 6.3 acres to the east of the fire station is owned by Oconee Hospitality Group LLC. 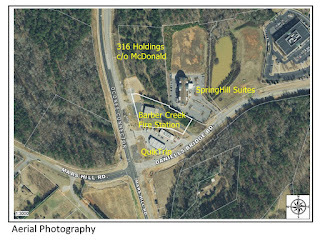 SpringHill Suites occupies roughly half of that 6.3 acres, and the 1.9 acres on which the fire station sits would provide additional land for a hotel as well as direct access to the Oconee Connector. Cheddar’s Casual Café at the entrance to Epps Bridge Centre on Epps Bridge Parkway will change ownership on Aug. 28, resulting in a new application for restaurant sales of beer, wine and distilled spirits, Oconee County Clerk Kathy Hayes told the Board. Kevin Leff told the Commission that Darden Restaurants, based on Orlando, Fla., “is acquiring the Cheddar’s concept.” Darden owns Olive Garden, LongHorn Steakhouse, Bahama Breeze, Seasons 52, Eddie V's Prime Seafood, The Capital Grille, and Yard House. The Oconee County Cheddars currently is owned by C&P Company LLP of Macon. The Board of Commissioners approved the application, pending receipt of a lease for the property and final paperwork on the change of ownership. Carlos Miranda, who is in the process of moving to Oconee County, applied for a license to sell beer and wine in a convenience store to be called TreeHouse Market, located in Falls of Oconee on Macon Highway at McNutt Creek. Miranda presented a lease agreement for suite 206 in the complex, though no actual build-out permit has yet been issued for the property. The small shopping and retail complex is across Macon Highway from Athens Ridge, which caters to students from the University of Georgia and from the Oconee County campus of the University of North Georgia. The Commission approved the license. The Board of Commissioners agreed to spend $45,091 with the Georgia Department of Transportation for a county-wide transportation study. In response to a question from Maria Caudill, a member of the county’s Land use and Transportation Planning Committee, Daniell agreed to involve that citizen group in the study. The Commission authorized Daniell to enter into negotiations with R.W. Allen of Athens for construction of three multi-use fields at Oconee Veterans Park. New parking also will be included in the project. Daniells said some of the details of the work have not yet been settled, such as the kind of turf to be used. The discussion of the rezone request for Fire Station #8 begins at 6:49 in the video of the meeting below. County Clerk Hayes presented the two alcohol license requests, starting at 15:10 in the video. 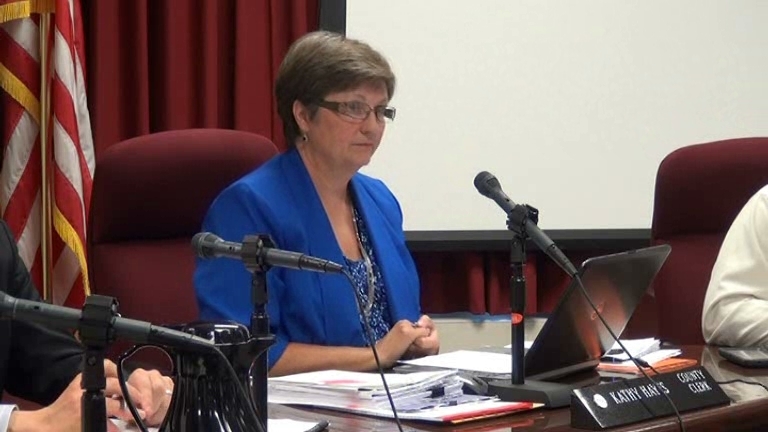 Daniell discussed the contract for the transportation study, starting at 2:55 in the video. Daniell discussed the field expansion at Veterans Park, starting 12:25 in the video. OCO: BOC 8 1 2017 from Lee Becker on Vimeo. Yet another less-then-stellar decision which requires repair. Building the station up on that hill in an obviously commercial hub when property just around the corner was available at far lower inconvenience, cost, and property value was not smart. That said, praises for fixing that error rather than waiting the usual decade or so typical of decisions by our leaders. That fire station needs to be re built asap. Is this not going to cause a break in coverage for the northern area of oconee. Where and when will the relocation of a new facility and temp holding of ems/fire vehicles be. Just seems important to know that before a re zone request.